An upbeat Christmas melody drifted through Cutler Nursery as Dillon pulled into the lot spattered with cars. He switched off the ignition and opened the door of his pickup to the bite of a chilly breeze. Though Thanksgiving leftovers had barely been devoured, winter seemed determined to wake from its nap and make an early arrival along the streets of Clover Cove. Dillon’s boots crunched over gravel as he wove his way through a cluster of Frasier firs that had been delivered by flatbed trucks to the nursery that morning. They now flanked the entrance in a winding labyrinth. Dillon and his brothers, Reese and Wyatt, had spent the better part of the day using lengths of waterproof ribbon to organize and color code the fragrant, fresh-cut trees. Sizes ranged from a flurry of modest three-footers to a majestic sixteen-foot goliath that his sister, Maddie, had spent a good hour trimming with blinker lights and shimmering ornaments in red, silver, and gold. Her handiwork was sure to draw customers before one of the larger local businesses snatched up the fir for their foyer. Or perhaps his second eldest brother, Reese, would take the tree home to his wife, Peyton. It was, after all, their daughter, Lissa’s, first Christmas, and the farmhouse they’d recently purchased along Clover Creek would provide a perfect backdrop with open cathedral ceilings that soared above an expansive great room meant for family gatherings. Dillon paused for a moment, inhaling the pure scent of Christmas with a touch of longing. All of his siblings had found their life-mates—Wyatt with Kami, Reese with Peyton, and Maddie with Gunnar. Talk about being the odd man out. His ego still stung from Jacqueline’s brusque and unexpected brush-off when the time came for her to return to New York City. They’d spent the past year working together at an internship in Asheville, North Carolina, and Dillon had thought she might be the one. But she had her eye on city life, choosing to beautify the concrete jungle. Dillon couldn’t stomach the thought of all those people and the congestion they brought. So, in the end, God seemed to have other plans. Dillon shook off the thought as he continued to wind his way through the maze of trees. 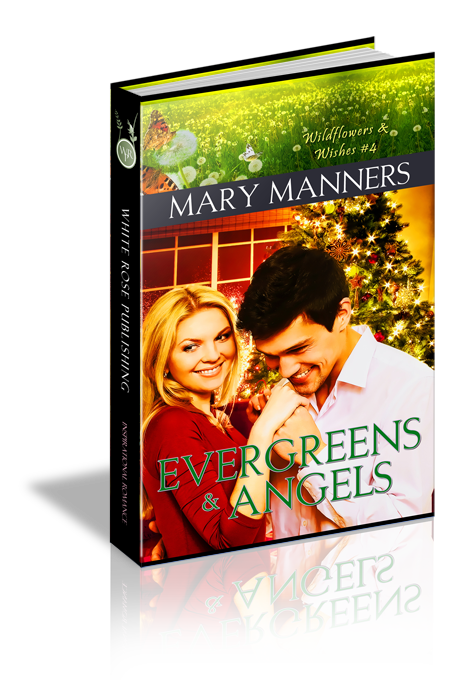 The crisp, sweet scent of evergreens lingered, evoking memories of Christmases past when his father was still here with them and the family all together. A wave of nostalgia swept through, and Dillon paused to grasp a tree branch. The soft pliable feel told him the boughs were fresh, the tree ready for a home where it was sure to stand as a joyous symbol of Christmas cheer. Sticky sap clung to Dillon’s fingers, and he brought his hand close to his face, inhaling the distinct aroma. Dad had loved the holiday. He’d be proud to have Dillon home again with a master’s degree in plant sciences tucked neatly beneath his belt. Dad would be proud, as well, to know Dillon joined in the day-to-day operation of the family’s nursery. It had been Dad’s dream to grow the nursery into a business worthy of recognition. That recognition had come recently, in the form of a cover article in the nationally acclaimed Horticulture Today Magazine. Now, the entire Cutler clan had come home to Clover Cove once again—Wyatt, Reese, Maddie, and Dillon himself—to protect their father’s dream, keep it alive and growing. Dillon exited the grove to find his mother straining to organize a parade of red and white poinsettias along the top tier of a triangular display just inside the main greenhouse. Foil in festive shades of gold, silver, and cherry-red that cocooned the half-gallon pots sparkled beneath the nursery’s spotlights and, though his mother stretched to her full height, she barely reached the highest shelf. Dillon strode to close the distance between them, swiping the sticky sap from his fingers onto the thigh of his jeans as he went. Brynn Jansen smoothed a quilt over Gran’s shoulders and slipped into a rocking chair nestled into the corner of her grandparents’ bedroom. Tuckered from her recent stay at the hospital and the subsequent check-up with her physician, Gran had settled into a nap about ten minutes ago. Gramps had nodded off in the living room recliner soon after, nursing his ribs and a few bruises. Brynn listened to his not-so-gentle snores as they barreled down the hall. Last week’s car accident had been rough on them both. Brynn sighed, drinking in her surroundings. A solid mahogany chest and bedframe filled the modest room as hunter-green and tan checkered drapes handcrafted by Gran flanked a bay window with a built-in seat covered with oversized throw pillows in shades of russet brown and sunflower yellow. Gran had always carried a soft spot for the combination of bright and earthy colors. Now, a window shade was pulled tight to block out the winter-gray sky. Brynn sensed a dusting of snow—maybe more—on the way. A slight thrill raced through her. She knew the first snowfall of the season held a special kind of magic. Gramps’s sweater—the same soft, tan wool with patches at the elbows he’d worn when she was a child and he’d snuggled her on his lap—was tossed over the foot of the bed. The scent of pipe tobacco, sweet and rich, conjured happy childhood memories of time spent here…long tromps through snow-laden sidewalks with Gramps as she chattered on about school and the books she’d read and the fact that she wanted to be a nurse when she grew up. He always listened intently, never hurried or bored by her soliloquies. Time with Gran was plentiful, as well. They worked together in the kitchen where cheery mustard-yellow walls and walnut cabinets lent a gentle embrace of warmth that even heat from the stove couldn’t match. Brynn and Gran sang along to Christmas carols as they fashioned sugar cookies shaped like angels and bells and pecan pies while a ham basted in brown sugar readied in the oven. The holidays never failed to be rich in happiness at Gran and Gramps’s place, even the year Brynn turned twelve and Gramps spent the entire Thanksgiving holiday flat on his back with pneumonia. Unable to work for a stretch of weeks, he’d been furloughed from his job down at the lumber yard. Money had been tight and as Christmas closed in Gramps lamented it might be a year without a sprig of mistletoe to be hung in the kitchen doorway—a travesty since Gran and Gramps often paused beneath the door frame for a laughter-filled kiss—or even a tree to decorate and a few simple gifts to place beneath it. Gramps felt especially terrible, because Brynn’s mama was gone nearly a year by that time and her daddy had been called away on business—again—so she’d been sent to Gran and Gramps’s for an extended stay. Brynn didn’t mind the lack of trimmings, though. Simply spending time with Gran and Gramps provided enough holiday cheer for her, even without all the fuss. Their home was filled with laughter and a deep sense of peace and calm that she had yet to find anywhere else. Brynn remembered how, one snowy night more than a decade ago and only days before Christmas settled in, a random act of kindness deepened the warmth and revitalized their holiday cheer. Now, memories played out like a movie reel. The doorbell rang and Gran, much younger and agile, scurried to answer it, wiping her hands on her apron as she made her way through the living room where Gramps rested in the recliner. A fire in the hearth crackled and danced, making Gran’s eyes twinkle. Snow swirled in, bringing a nip of frost as Gran threw open the door. On the porch stood a boy of about Brynn’s age—teetering on the precipice of thirteen. He stood flanked on either side by a man and a woman. The man, tall with dark hair spilling from a stocking cap, had green eyes brighter than any holiday lights Brynn had ever seen. He clutched a Christmas tree that dwarfed him in height and was wrapped tightly with twine. The woman’s white, straight teeth curved into a smile that rivaled the shimmering snow. She carried a cardboard box filled with a huge ham and all the trimmings. But it was the handsome boy that truly captured Brynn’s attention. Tousled midnight-black hair spilled across his brow to shade eyes the color of delicious chocolate nuggets. His gaze locked on her, and held, as a lopsided smirk bowed his lips and radiated mischief. The roguish look stole her breath, and she pressed a hand to her chest, feeling her heart race to a gallop beneath the soft cotton fabric of a crew-neck sweater. As his gaze loosened and continued its journey, drinking her in, she imagined he spent a good deal of his time at school warming a chair in the principal’s office. There was definitely something about him—an air of mystery with a touch of adventure—that captured her attention. “Yes.” Brynn lifted the wreath to her nose, surprised that it didn’t have a scent. No matter, she knew good and well the purpose of mistletoe during the holidays. She lifted it over her head. “I know people like to kiss under it, that’s all. But the berries…no.” Yet, she’d like to know. She inched closer to the age when she might actually welcome a kiss. And what better time, considering the mistletoe and all. It was a holiday tradition, right? Plus, at twelve—almost thirteen—she had to admit curiosity about boys had set in and planned to stick around. That brought a round of laughter from the adults, who Brynn had completely forgotten were standing there, gathering in the surround-sound of her and Dillon’s conversation. Ugh! They stomped their boots over the welcome mat, covering it with a flurry of snow as one by one each stepped into the warmth of the living room. A fire crackled in the hearth. Brynn had stoked it herself with quartered wood from the basket there, just the way Gramps had taught her. What happened next with the adults was a bit fuzzy. Dillon stole Brynn’s attention as she followed his every move. It was as if he’d captured her in a spell. She did recall that Dillon’s father—Rick Cutler—made small-talk with Gramps while he jostled the tree into a stand directly in front of the living room’s bay window. Carefully, Mr. Cutler sank to his knees, tightening the stand until the tree stood straight and tall. While he worked, Hattie Cutler carried her box into the kitchen alongside Gran. Their chatter, light and happy, drifted. All the while, Dillon crossed his arms tight over his chest and leveled Brynn a gaze, silently scrutinizing her as if she were a rare lab specimen nestled in a jar. She raked her fingers through her hair and then ran a palm over one heated cheek. Why did he stare at her so intently? Was there a smudge on her face…a sprig of broccoli wedged in her braces? Gramps and Mr. Cutler continued their conversation, oblivious to the standoff between their children. They might have been miles away instead of right across the room. Dillon finally broke the stare with a slight nod of his head. He toed the wood floor that had puddled with melting snow from their boots as his demeanor seemed to soften. “Do you think you can manage to get that mistletoe hung?” His voice was low and coaxing; Brynn thought that must be exactly the tone movie stars used while being interviewed. “Are you sure? You don’t look…” He paused as Brynn’s gaze narrowed to fireballs of heat. One of her hands plastered over a hip. So, together she and Dillon went. Once in the kitchen, Gran ushered them to the table and poured two glasses of milk before setting a platter of warm, moist cookies on the table in front of them. Dillon shrugged out of his jacket, tossing it over a chair back before he snatched a cookie and dove right in. “Thank you, Mrs. Jansen,” he murmured around a mouthful of crumbs. Brynn got the feeling Gran had left them alone on purpose. She seemed to understand Brynn’s need to stretch her wings toward adulthood. Brynn took a cookie and nibbled a raisin, though her belly felt as if it was stuffed with cotton. It dipped and whirled as Dillon glanced her way, his eyes dark as they scrutinized her. Gran and Mrs. Cutler returned to the kitchen, and Brynn felt a little stab of sadness as Dillon was ushered away. They’d just met, shared only a bit of conversation and a handful of cookies, and yet she felt an odd connection…as if she’d known him her whole life. It was surprising and a bit unsettling, as well. When the Cutlers departed with a plate of cookies in hand, washed in a flurry of heartfelt thanks, Brynn and Gran commenced to decorating the tree while Gramps supervised from the recliner. In quick time, lights twinkled and ornaments winked. Gramps gathered enough strength to rise from the recliner long enough to place a treasured star atop the highest bough. Then he led them in a prayer, thanking God for the Cutler’s generosity in this time of need. Brynn still remembered the tears that shimmered in Gramps’s eyes, the hitch of his voice as he spoke. Her gifts had been placed beneath the shelter of boughs to be opened on Christmas morning. Dillon’s prediction of “girly things” had been spot on, much to Brynn’s relief. She still had the diary, which she’d quickly filled from cover to cover with thoughts of Dillon and this magical holiday season. It lay safely tucked in a dresser drawer. A silver heart necklace had graced her neck each day since, and she thought of Dillon every time it caught the light. The Cutlers’ kindness was strong and lasting. It had ignited in Brynn the desire to help others, which led to a degree in pediatric nursing. The knowledge afforded her the ability to care for Nana following her car accident and to keep watch over Gramps as he fretted because he’d been the one driving. Wind moaned through trees outside the bedroom window, drawing Brynn from her memories. Gran shifted in the bed and sighed through a dream as her body continued its journey toward healing. Once again, Brynn thanked God that neither Gran nor Gramps had been injured worse in the car accident along Highway 441, that in time Gran’s fractured arm would heal and Gramps’s bruises would fade and he’d fully recover. It was a miracle, for sure, given the speed of impact and the state of their SUV. A chill whispered as Brynn delved into the basket on the floor beside the rocker, that Gran kept stocked with magazines. Settling on a periodical graced with a bright splash of blooms along the cover, she spread it open across her lap and thumbed through the articles, gasping as she came to one sprawled along the centerfold.